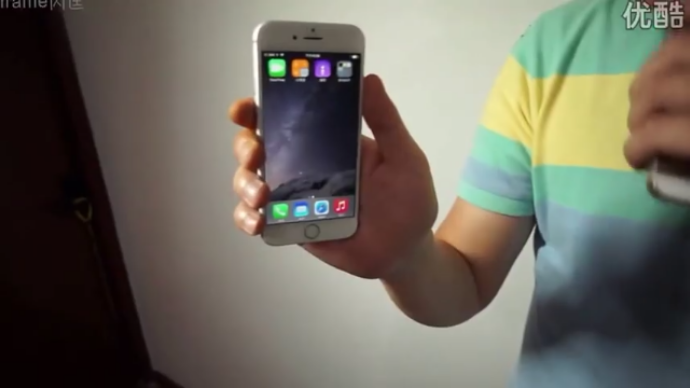 iPhone 6 rumour patrol – The first real hands on video possibly!? With just hours to go until we see the real thing and a video has emerged which apparently shows off the new iPhone 6. The handset is larger than the current models and, as the gent is the brightly coloured top reveals, it’s running iOS 8 and has a working Touch ID fingerprint system.. The video has some of the usual hallmarks of a “random strange leak”, such as a wobbly camera, strange lighting and a dubious source, but we’re disappointed with the clarity of the footage (leaked videos are usually blurry) and the fact that we can actually see the guy doing the demo (usually these leakers hide their identity). Tsskk.. must try harder. Published on Saturday, all we do know for certain is that this is a fairly dull office corridor, this is a man with a pretty cool shirt and this appears to be the first video with iOS 8 on the device. Here we have a slightly protruding camera, bigger screen and … Hey! Will you stop throwing money at the screen please? Wait! Never mind the iPhone 6, what's wrong with the iPhone 5s ?